Detroit has lost 14 of its last 15 trips to Minnesota, with its lone win since 1997 coming in 2011. 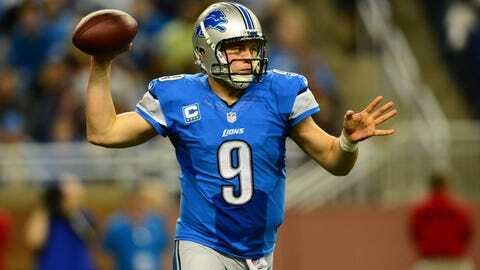 A month ago, the Detroit Lions were in control of the NFC North. They enter Week 17 with nothing more to play for than a .500 record. After three straight losses to ensure their most recent late-season collapse, the Lions are ending 2013 with a consolation game Sunday as they help the Minnesota Vikings say goodbye to the Metrodome. The Lions (7-8) have lost five of their last six, posting a minus-15 turnover differential in this stretch that has caused them to miss the playoffs for a second straight year. "We put ourselves in a bad, bad situation," linebacker Stephen Tulloch said. "Unfortunately, we can’t dig ourselves out of it now." The Vikings (4-10-1) did themselves in by losing seven of their first eight. "We realize that there is one week left in the fight," linebacker Chad Greenway said. "We need to get a win at home to put the Metrodome to sleep. We have to bring our best game." Lions coach Jim Schwartz and Vikings coach Leslie Frazier now find themselves in similarly dubious situations, potentially coaching the last game for their respective teams. "For our players, it’s important that they focus on the task," Frazier said. "That’s what I’m asking them to do, and I need to do the same thing. It’s very, very important if you want to have a chance to win these games down the stretch that I stay focused on what’s involved with leading our team, and I want them to follow. It’s important I handle it the right way." Matt Cassel will start at quarterback for the Vikings, closing out a season of near-weekly uncertainty at the position that included Christian Ponder and Josh Freeman. Cassel fell to 2-3 as a starter this season with last Sunday’s 42-14 loss at Cincinnati. He went 13 of 27 for 114 yards with a touchdown and three interceptions. Adding to the game’s irrelevance is the uncertainty of its two biggest stars, Vikings running back Adrian Peterson and Lions wide receiver Calvin Johnson. Peterson is hoping to play after running for 45 yards on 11 carries in Cincinnati a week after sitting out with a sprained right foot. Peterson took part in practice Thursday. He said prior to the workout his "mindset is to be out there" Sunday, but Peterson acknowledged he felt uncomfortable last week against the Bengals. He seems less concerned with his health right now than he is with his coach’s status. "I’m definitely not an individual that’s looking for dramatic change like that," Peterson said. "It will hurt if he leaves." Johnson, meanwhile, is dealing with knee and ankle issues. He was a game-time decision in last week’s 23-20 overtime loss to the New York Giants and was held to three catches for 43 yards. "His knee was bothering him and his ankle was a problem," Schwartz said. "We were trying to use him in the red zone and on third downs, but he wasn’t close to 100 percent." Matthew Stafford’s struggles have been a big part of the Lions’ downfall as he’s thrown 11 of his 19 interceptions in the last five weeks. He’s one shy of matching his career high of 20 picks from his rookie season. The Lions opened the season with a 34-24 home win over the Vikings, but they won’t be upset to see the Metrodome torn down. Detroit has lost 14 of its last 15 trips to Minnesota, with its lone win since 1997 coming in 2011. While Sunday’s result may be inconsequential in the standings, team decisions will certainly begin to fall into place after it’s over. "I’ve been in situations where teams didn’t fulfill expectations and everyone was back and gave the team another opportunity," Lions receiver Nate Burleson told the team’s official website. "They kept that same team together who had so much promise. "Then I was with teams who were blown up and it was like a complete (overhaul) of individuals. I guess you expect the worst and hope for the best in situations like this. At the end of the day, it is what it is." What Burleson isn’t expecting is for the Lions to lie down in their season finale. "It would look even worse to people that still are following this team if we went to Minnesota and mailed it in," he said.